Courtney Reagan and Marc Faber discuss whether or not it is time to pull out of the stock market. 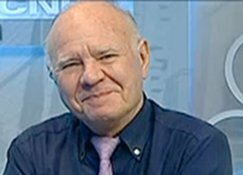 Dr. Marc Faber said it’s a good idea to take money out of the stock market. Gold can eventually be a source of profit, according to Faber. He said it’s possible the price of gold can go somewhat lower, even though he thinks it’s now at a reasonable level. “I keep on buying gold and I have faith that gold prices will eventually be higher,” Faber said. Faber said that, in general, corporate earnings will disappoint. “They may not collapse, but I don’t think they will be as a good as expected,” Faber said. He said cyclical stocks, such as semiconductors and materials companies, will have tough time matching earnings expectations.